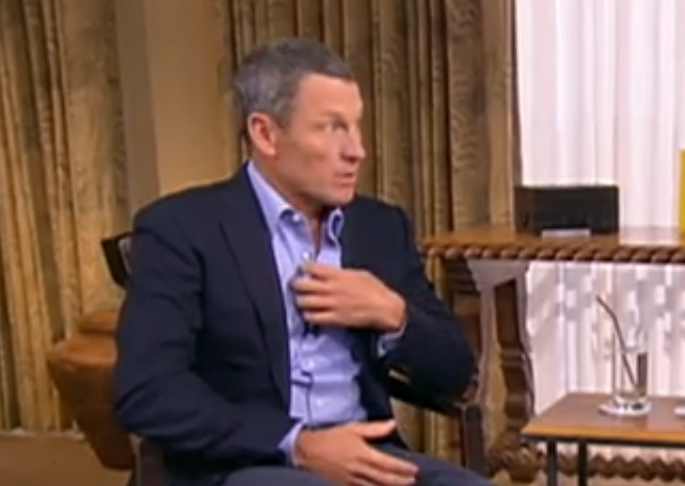 Another nonverbal signal of Lance Armstrong's insincerity is revealed in the way he touches his chest when trying to convey understanding and truthfulness. Most displays of "self-touching" are examples of what are known as MAPs (Manipulators, Adaptors or Pacifiers) and are, in general signals of anxiety - although when viewed in cluster-context, their meanings can be much more specific. At multiple times throughout his interview with Oprah Winfrey, Armstrong touches his chest with only the tips of his fingers & thumb. During moments when we feeling true sincerity (not seen above), gestures of chest touching involve the whole hand including the palm. This "palmar touch" occurs with the whole hand contacting the chest over the heart (left side of chest) and/or the sternum/manubrium (although parts may extend to the right side of the chest). Note in the above video segment during the 2:30 mark, when the disgraced bicycler says, "...I understand ..." Armstrong touches with only his fingertips over his sternum. This is a great example where a person's words contradicting his body language. Whenever the verbal and the nonverbal are in disagreement - the nonverbal language always tells the truth. It is contradictory body language to display a full-palm-to-chest nonverbal with one's legs crossed in the manner Armstrong has them configured throughout much of this interview (The "American figure-4"). If one had their legs crossed in this way, and then felt a moment of true sincerity, honesty, affection or empathy - the legs would naturally uncross. However, when clustered together, the "figure-4" along with the "fingertip-only to chest" contact are congruent with insincerity. Another important distinction of the full palmar contact vs. fingertip only contact is made over longer time durations and multiple observations. Full palm-of-hand contact to the left chest or sternum is seen more often in individuals with higher empathy quotients and thus are very rare in sociopaths. Those with low empathy quotients (such as narcissists, sociopaths and psychopaths) rarely display the body language of full palmar contact.